My name is Brigadier Jagod Makwar Narada. I am born in Um Sirdiba in 1965; I am from the Moro tribe. I went to intermediate school in Um Dorein; it was one year before the SPLA started. I was a member of Komolo, and we had some training by these guys: Mubarak al Masha and Mubarak Sharif al Din. They came by that time and they trained us in the bush, here over these mountains. We were hiding ourselves, nobody of us would declare he's a revolutionary; we were working secretly. And then we were students again, until the Volcano entered the Nuba Mountains in 1987. I joined the SPLM proper and we went to the South. It was a long journey, a long journey from Achirun up to Itang in Ethiopia. It took three months on foot. We met difficulties in the way. There was no road even: we entered in the bush. Sometimes there was no food, sometimes there was no water; clearly sometimes we fell in an ambush. We went in August, it was the rainy season. Sometimes we had to cross big rivers; sometimes we got heavy rains. We entered in thick trees and sometimes we would feel in the desert: we couldn't get water. Our colleagues, some of them died; some of them deserted back [to the Nuba Mountains]; some were lost in the bush. There were many difficulties when we were in the way to Ethiopia. I think when we were young, the people in Moro would not feed us properly. We ate the meat; we drank the milk, we took the honey and whatever, because we were wrestling and fighting each other. We were surprised that we didn't get food [along the way]. Many of us died, really, we lost our colleagues, best colleagues: we lost them there. yes, to the feeding centre in Fanyado. We fed ourselves there; we took more than five months there, and then, in 1989, they armed us and we came down from Ethiopia up to here, to the Nuba Mountains, you see? I was left behind in headquarters at Fariang with our late Yousif Kuwa. I was a Sergeant- Major at the time; intelligence personnel. When we came, I think it was with one battalion, the Second Volcano battalion. We left Yousif in Fariang, in a place called al Dir and we proceeded to [Lake] al Abiad. We even took two days in al Abiad. Then the enemy was informed [about our presence] and they sent their troops to make an ambush and to capture Yousif Kuwa. They came with sixty-three trucks and four tanks and they got us near al Abiad. They attacked early morning, I remember that time; early morning. It was the first time for me to meet the fire of the enemy. Really: they pushed us and they defeated us there. The fighting took ten hours and they defeated us. Many of the men turned back; I myself I fought on. They capture one platoon from us: thirty-three men with one lieutenant. I managed just to escape, with three other guys. We hid ourselves and crossed their lines, avoiding many ambushes, to reach Torogi, in the Dar place. Yes, we entered Dar. After one week we were all together again, and we established ourselves there. For three months we had to defend ourselves in Dar. There was so much fighting; heavy fighting. It took three months and then they deployed us. [The government army] came up to our area in Tangali, where Commander Ismael Khamis Jelab was leading the Tegali Battalion. Because I am an intelligence man, he deployed me to Erbang, a place on top of the mountain in Moro there. I stayed with him for two months, until Yousif came to the Mountains. He gave new orders for all the battalions and redeployed them to different places. I returned to Tegali Battalion, and they gave us directives to go to the Western Jebels (Mountains). It was the first time to go to the western area, and we met many difficulties. There were many enemies on the road and there were many roads. We crossed east from Kadugli; Sabori; Delukus; close to al Tash; Kega and Dabri, and then we crossed the main road. From the main road we passed a place called Mayda, then we reached Timein and from there we came to Julud, to the top of the mountain. It has many holes with water and we established ourselves there. hahahaha; most of our soldiers deserted from there, they returned back to the eastern area! Hahahaha, we came with one battalion and we remained only seventy-six there. Oh, I nearly forgot something! When we reached the main road, after crossing al Tash, our reconnaissance stumbled on a tractor. Just a farmer plowing his fields, but they mistook it for a tank. Most of the men threw themselves on the ground and they remained like that until they escaped from there. So when the enemy attacked us at Julud, we lost all of them: there remained only sixty-seven. Commander Ismael reorganized us and redeployed the coys. I was deployed in Tulushi; the coy was commanded by First Lieutenant Nicola, an Equatorian, and three other officers. On our way to Tulushi we came across a garrison of the militias. I remember that one man came out. He saw us, he ran and reentered the garrison. Nobody came out, so we proceeded to Tulushi, to a village called Siada. We entered the valley there and we were met by some civilians from the village. They were happy to see us, because they had been briefed that we would come, by Mohamed Ali Tia. [Mohamed Ali was one of the political commissar, who mingled with the local population to win them over to the SPLM; he would also establish contacts with the Bagara and the Arab merchants, NotE]. This man was with us there, and when the people came they brought us water and some groundnuts and simsim, sorghum and goats and even mister pigs. Hahaha; they brought us mister pigs, and we slaughtered them and we ate the meat. And then they gave us information that there was a car coming from Lagawa, going to that garrison. Suddenly we saw that car crossing with the militias; our commander gave us orders: go and make an ambush with that car. Hahaha, you see, before we even stayed one night. It was the first time for me to make an ambush. We took a PKM machine gun, we were five and we made a stupid ambush. Hahahaha. We went to a stream they had to cross. Let me draw it out for you: here's the stream, here's the road and here are holes. We put our machine gun here. When they wanted to go down to the stream, the gunner started firing: gagagagaga, gagagaga. He managed to destroy the wheels, but they just started firing at us. Yaow! And we and another three guys entered the deep holes and then those guys came after us and we fought in the holes, with our hands - yes, for one hour! And those people in the militia garrison, they came with reinforcements. We were in an ambush ourselves! They surrounded us, you see. We had destroyed their car, so we couldn't use it anymore to ambush the garrison and we ourselves, we tired very much. And then we ran fast, we left the car behind. It's a funny story. Hahaha. We returned to our position, and we hid ourselves in the mountain of Tulushi. We occupied a large mountain that had water; it also had a lot of holes in the rocks and we established ourselves there. The military at Lagawa heard of the fighting and informed the government that the Anya Nya entered Tulushi. We were called Anya Nya at that time. They wouldn't say rebels; they would say gawaridj: outlaws. And the government sent a big force; they came and investigated; they arrested people and interrogated them. The people said: "yes, the Anya Nya came here, and they crossed this area and they climbed the mountain. But we didn't meet them and we never saw them again. We don't know where they are now; they used this road and they climbed up here. If you want to see them you can just follow them." They beat them, and they said: "you are bad people! Why have you brought the outlaws to us?! These are forces, we must just defeat them, but you let them go, you didn't report to us. If [we find out you have anything to do with them], we will burn all these areas. And then their agents tried very hard to find out where we had gone to. We were hiding for some time, and then we would travel to another location; we were jumping around the mountains. Meanwhile we established ourselves in Tulushi and we started our policy of sending out our people to make the committees. We convinced the wise men of our cause and then we recruited and mobilized the people. We got 200 recruits and we took them to Julud, to headquarters. We left them there and Ismael selected one officer and some accompanying forces who took them to the East, to Badura here, because that's where all the new recruits were gathered. From Badura they were sent to Kurji; from Kurji to Tabanya; from Tabanya to Torogi, to al Abiad, to Fariang. Yes, we started working like that. It's a long story. The Government called all the sheikhs, all the meks and the chiefs to Lagawa. They also called the Tulushi chief; they called him and arrested him. They roped them and sent them back to a place called the Mujagun Comda area. They shot them from [the wall] of a mosque. Six of them, and Muhamud, a very big chief. They shot them, killed them all in one place. They roped their hands behind their backs, yeah, and they killed them. We received the information, but we didn't want to reveal ourselves. We managed to hide around Tulushi for one year. We mobilized the people and all of them joined the SPLM. Then the Arabs came back to the area from Northern Kordofan. They started to attack the people in the roads and on their farms. They attacked Tima village first, yes, they started at Tima. Kereker was next, Tumo and then they came to Ras el Fil, Nimiri Shagu, Tarin and even around Lagawa. We fought with them as civilians. Yes, we mixed with the civilians, using the same local guns as they did: the mahmatun, the abjiga, there are many different types. Even when people from the military were among the villagers, they didn't recognize us as soldiers. They saw us, but they never got evidence that the Anya Nya was around. We lived like that until 1990. There's a road coming from Tulushi to Wali Abu Saida to Dilling, and we went there quickly to make an ambush. While we were waiting, we sent a civilian, to the Abu Saida market to bring us some boots and a barrel for water. Suddenly he came back to report: "there is a truck that came with one platoon of the enemy side and with Abdel Hamid Mahmud Zahar, the chief of Wali. They say he captured Abdollah and he's taking him to one of the schemes outside Wali." This information surprised us: where did this enemy come from, and how did he arrest our guy Abdollah? We split up into two coys - well, they were more like platoons, each with thirty men - and now we made ambushes in two directions. At evening, around four o' clock, the truck came back, full with soldiers. We had one APG-7 and one machine gun, making our ambush, and when the truck reached in the middle, the gunner of the APG fired: baaaaam! The fire started and we started: takkatakatak, pow, takatatakatak. The one who was captured from us, Abdollah, jumped off the truck with a rifle he took from a soldier, hahahaha, and he showed us: that's Abdel Hamid. Pfew, tsjew: we followed Abdel Hamid; we didn't manage to capture him, but we destroyed this truck and we captured fifteen GIM-3 rifles, and we got back all our luggage! It was there in the truck. I can't forget those things. Then Mohamed Juma came with the four battalions of Intisar. He headed two of them to our areas in the west, to support us. The enemy had information and they followed him. The day he reached Tulushi they came with one hundred trucks and five tanks. They came with heavy artillery, and they attacked us; they started fighting - heavy, heavy fighting. Moluk, Lieutenant Colonel Moluk - he's an engineer - saw how all the trucks went to close off Timein. [In an attempt to stop them] he was there, in a small stream, trying to place an anti-tank mine. The driver saw him lying down, and he tried to kill him, but Moluk made it; he didn't manage to dig down the mine but he made it. He ran out of there and eeeeahm! All the trucks returned back, and we followed them. We defeated them, I think we killed sixty-five of them that time, yes we killed sixty-five. 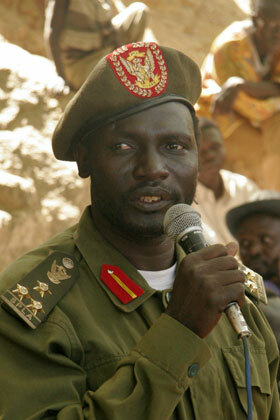 One our side they captured five from the new battalions led by late Commander Mohamed Juma, and they killed seventeen. Seventeen died, yeah. From that time all the area knew that the Anya Nya, the gawaridj, had entered the westerns areas, and that they had started fighting with the military, as a regular army. The militias arrived there to fight us and we were there until 1992, when that heavy battle took place, if you've heard of it: the battle of Tulushi. When Mohamed Juma entered, I think in December, they sent a convoy from two sides, fighting us in all directions. One convoy started from Wali; it went to Julud and then it proceeded to Tulushi. The other one came from Lagawa and attacked us in Tulushi, in a village called Karalenya. We defeated them and we drove them back, all of them. They retreated and established themselves in Nimir Shago, in the Kamda area near Lagawa. They reorganized themselves there and then they came back. I think Mohamed Juma was in our garrison in Ras al Fil. I was there, commanding a platoon as a lieutenant. Sometimes I was working as an intelligence man; sometimes I was leading a platoon or a coy. Early morning, six o' clock, they started firing at us; we heard the artillery: woooow, badjuu! And then they attacked us. At the same time we heard that they were attacking us in another place, called Ga'arada: they attacked us in two places at the same time. We fought with them, but they were many: a big, big big number of soldiers. We fought with them all day. We were at the foot of the mountain and when they attacked we climbed up, but not very high. For one month we fought them from that location, yes, and then the second month they threw us back, so we climbed higher. There we continued for one month, and they added to their numbers until they were 45.000 soldiers, yes, 45.000, including urgent forces from Iraq and Iran and next from Pakistan. We killed them and we got their rifles and their documents. We captured them, they are still there, buried in the rocks. We captured some of them alive and when we investigated them, they told us their countries. Yes they came and they said they were told the Nuba people were Christians and unbelievers. We were not Muslims, and that's why they came as mujahadin to kill us; that's why they came to Sudan to attack the people in Tulushi. That heavy, heavy fighting in Tulushi took five months. Five months of difficulties there. They climbed up and supported themselves, we defeated them, they retreated and came back and we defeated them. In the end there was no medicine to treat the wounded. When one of us was injured, we would just look at the wound, maybe put some wild honey on it and as soon as he would be a bit better, he would return to the battle. There was no water; sometimes we drank our own urine. We fought heavily with the government army over the water holes and in the end we took them, but they had poisoned the wells. When we drank the water, we became paralyzed for some minutes. Some minutes and then we would be better. Nobody died, but animals and insects all died when they drank that water. it's a long story, but let me just tell you that until the peace was signed, they never managed to defeat us in the western areas. After the fighting I was redeployed to Lemun. The late Yousif Kuwa called me back here and I came to Mirawi as an intelligence commander of the Mirawi battalion. I fought in Agap, the area around Moro, and then those of us who had been fighting in Tulushi were recommended for promotion. I was promoted to First Lieutenant and then late Yousif Kuwa gave me orders to go to Kurji to take over command of the battalion there from First Lieutenant Kamal al Nur, who is a Colonel now. I was surprised, I said: "I never lead the forces; I'm an intelligence man, I only know much of intelligence." But he said: "now these are orders: you just go and learn there. Go and take that responsibility, I'm sure you're going to just fine." That was in 1993. Yousif Kuwa was going to travel from Toroji to Kenya; it was the first time a plane landed at Toroji. He gave me advice; he said: "You're going to Kurchi to command a battalion. I send you there because I know you. The Government army has been gathering a big number of the forces in Kadugli; right now they have reached al Hamra. They are coming to capture Um Dorein and I am sure that you are just not going to defeat them. They will enter Um Dorein by any means, because they are a big number and we hardly have any ammunition. But here's why I want you there: I request from you to do your best to control the civilians; just not to give the enemy an opportunity to take our people to their side." These were his directives and really, I obeyed the orders. Late Yousif Kuwa went to Nairobi and Commander Ismail was taking over from him. We took three weeks; there were celebrations in Brham; the 16th of May. All the people went there while I prepared myself to go. Then I received a message that we intercepted information from the enemy, saying they would move to attack Um Dorein tomorrow. So they gave me orders to organize our forces; keep them in standby to wait for that enemy. Yes, I postponed my mission and I sent out messengers to all our forces to gather in Um Dorein. Then I went there myself and I waited. Early next morning we spotted them on their way to Abu Hashim; we saw the cars entering and we went to Abu Hashim to attack them there. We attacked them there for one week. I lost one lieutenant; he was from the South, from Equatoria. After seven days we attacked them at night and we fought all night. At dawn I saw that we had to retreat to Um Dorein, and before we reached there, they followed us with 150 trucks. Hahahahaha; really: we fought much! Our ammunition was nearly finished, but while we were in this heavy fight, people were dancing in Brham! The Government army attacked us and they sent their trucks through to the town of Um Dorein. When they entered we fought them all the night. In the morning I wrote a letter to commander Ismael: "the enemy entered Um Dorein; we've surrounded them and we're fighting them." And they still continued that celebration. When they finally came [with reinforcements] the enemy had already taken the places; they had dug their [fox holes] and occupied the hills around them. We continued fighting but we couldn't defeat them. They are still there, until now. When that had established themselves at Um Dorein, they started [a new offensive]: they entered Brham and Toroji. They came and occupied all those areas, and they proceeded to take Um Sirdiba. We fought hard in Um Sirdiba, but in the end we didn't have enough ammunition. When Yousif Kuwa left to Nairobi, he left one box with ammunition only, for general use in the Nuba Mountains. It held 750 rounds of bullets. It was difficult that time; a long story, a really long story. We barely managed to control our people. [Finally] the first flight came with ammunition; it landed at Nyakama and we were reinforced. It raised our morale; we became stronger and we started all over again. Actually we made it through the difficult time by using delaying tactics. Our enemies, the Wali of Kadugli together with the division commander, sent a message to me through some prisoners. They said: "you: you come and surrender yourself, because we are going to win soon. If you come we will promote the two counties in your area, Um Dorein and Um Sirdiba, to provinces, and you will be the supervisor of those provinces." Hahahaha. Then we received information that a big force was gathering at Kadugli; it would come to attack the Moro area, to capture Yousif Kuwa's headquarter in the Nuba Mountains. We came together with commander Ismael and the other officers. I think brigadier Izidin was there also, and we concluded that we had the right to use delaying tactics, because we didn't have enough ammunition. So we planned to delay this operation before it had started, and I took the responsibility: I gave a reply to their letters: "I agree with your ideas and with what you have written to me. I think it is good, because when the Popular Conference Party came to the ruling, it really gave freedom to everybody to come and rule his own area. I think it would be good if I became the commander of the area, as supervisor of two provinces: this is what I have been fighting for; this is why I went to the bush - this is a good idea." That's what I told them: "but I just want to organize myself, to mobilize my people. I want to make a coup: we will capture the headquarters; I will kill Commander Ismael Khamis Jelab and I will occupy all the areas. Then I will call you so I can hand over these areas to you." Hahahaha. When I used this tactics, people in the end started to believe it. Many said: "Jagod is going to surrender himself, together with his brother in Law, commander Ismael." He had married two girls from my tribe, you see. But the people didn't know our policy. can't you forget these things? Let us come out, and have some markets in the bush." Before, late Yousif Kuwa had used this policy too. He had made an agreement with them: they came and brought us some salt and other goods we needed. This was called the Um Sirdiba Agreement. But that time it didn't really succeed. I think the enemy found out about it and they stopped it. But now we went ahead again with this policy. We convinced the [Arab] people to organize submarkets, as they were called, in the bush. We said: "we will give you our cows and our cattle and everything you need - and then you will give us what we need, even ammunition. If you manage to bring us one box, we will give you one cow. Even if you need two cows for a box, we will give it to you." And this time they agreed. Meanwhile we continued to tell the Government that we needed more time to organize ourselves. They gave orders to the troops: "don't move, we have a policy; three will be a coup soon." To prove [our intentions] I sent some of our officers to them: Maluk was one of them; Lieutenant Suleiman el Lira and Lieutenant Jagub - all of them are dead now; they killed them - and then there was Abud. Last time I saw him he was a major, no, a lieutenant even. I sent four officers; they went to Kadugli, where they talked to the authorities, and even to the military officers there. They met two times, three times, and they were pressed: "You, if you're really serious about making this coup, about coming here to surrender yourself, then go and tell Jagod to come by himself to meet us." When they brought this information to me, I sent Maluk with a letter to commander Ismael, and commander Ismael said: "just use your right policy: you just agree to meet with them in the middle; not in Kadugli, but somewhere in the middle there in the bush, at the point where you cross the stream before you come to Um Sirdiba. Chose a location in the bush there, to meet with them, and just be careful: take your forces with you and make an ambush - and then you promise to come." "Yes, I will do my best." These were the orders and I obeyed them. I sent them a letter asking to meet each other in the stream, there in that location. They came before I came; they had already organized their forces. They had come with two tanks and three jeeps mounted with machine guns. All their forces had dug their holes and they were hiding themselves with grasses and whatever. We came with two coys; we sent them out to make an ambush over there and we came with one platoon. We reached the road; we took it and we reached the meeting point. There is one big tree there, and when we reached the tree, I saw one jeep mounted with the 12.7 coming towards us. One of the security officers called Haiman - he's a major now by the way - came over to greet me. He was happy! And then we saw the tank coming out, and another tank. We got ourselves surrounded. but there has been a change of program." I said: "why are you changing the program?" "Well, these are my orders from the Wali, and even from the division commander. And they received their orders from Khartoum; there is a delegation coming from Khartoum to see you, and they want you to come with us to Kadugli to meet them their." I want to make a coup." This was the policy I used, because I wanted them to believe that I was serious. "If I went [to Kadugli] people might recognize me. If they find out what I am doing they are going to arrest me and keep me [in prison] and we are not going to succeed in our mission." you just do your best." When I heard that I talked to my colleagues; we spoke in our own dialect and because they were Arabs, they couldn't know what I was saying. We were five officers and I told them: "this is a dangerous situation. We have gotten ourselves in an ambush. Everybody just ready yourselves: if we are going to die today, we are going to die, but encourage yourself." We didn't want to fight with them so I said: "as we came with this policy, let us carry it out. If they want me to go to Kadugli, I will go; if they want me to go to Khartoum, I will go. PS. Jagod went ahead with the plan, he went to Kadugli, deceived the Government officials and bought the SPLA enough time to resupply itself. It earned him a great reputation among friend AND foe.